Does believing in good luck make you luckier? Everyone wants a little luck in their lives. Many rely on good luck before a big interview, event, competition or even in everyday life, and if something doesn’t go in the right way, many feel that it’s down to not carrying out their lucky superstition. To find out more about good luck in the UK, we carried out a study looking at different regions to see which, if any, are more superstitious than other parts of the UK and whether or not believing in good luck can actually make you luckier. Want to win the lottery? We found the regions with the biggest believers in good luck were also the regions with the highest number of lottery winners… Coincidence? If you need a little luck, you should try crossing your fingers. Of the people who believe that crossing fingers brings good luck, 20% of them have actually experienced good luck after doing so. Pucker Up: Almost ¼ of people believe that kissing someone on the stroke of midnight is the best way to secure luck for the upcoming year. The top 3 superstitions in the UK are revealed to be touching wood, with 30% of the UK believing in this, crossing fingers (26%) and picking up a penny (14%). Wales is the luckiest country in the UK, with 1 millionaire lottery winner for every 10,500 people. How does your region fare when it comes to good luck? Within the UK, we found that people in London are the biggest believers in good luck; with 57% of people in the capital adopting an optimistic outlook, the people of Yorkshire, contrastingly, appear to have a less positive one with only 44% of them believing in the same. 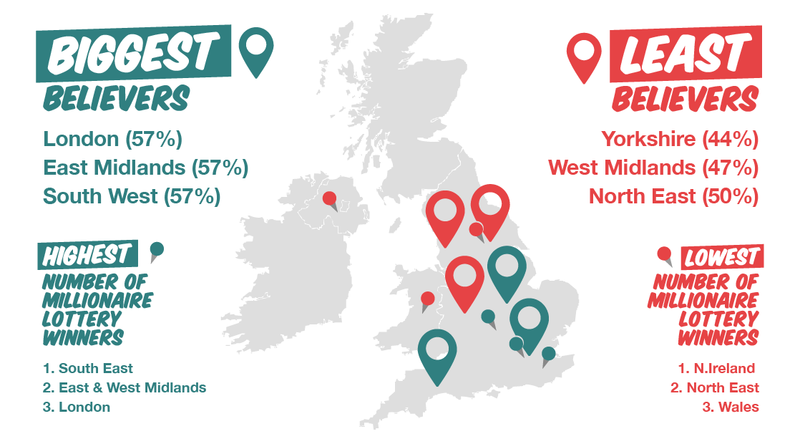 Other regions that rank highly are the East Midlands and the South West of England, with 57% of people in both regions believing in good luck. When looking further into these believers, we found that the Midlands* and London are home to the most millionaire lottery winners since it began in 1994. Could this be a coincidence or is the belief in good luck all you need? To add further evidence to this point, the North East is home to the one of the lowest number of good luck-believers, 50% , and also has the second lowest number of millionaire lottery winners. This region does have a higher-than-average belief in karma however, with 57% of people believing what goes around, comes around. Cross your fingers, it’ll bring you good luck! We asked people about their superstitious habits and whilst 53% of people believe in good luck, only 33% actually consider themselves superstitious. The most popular superstition was found to be saying “touch wood” or physically knocking on it. This ancient superstition is believed to stem from pagan cultures who believed that spirits and gods resided in trees. Knocking on tree trunks was thought to have roused the spirits to call on their protection for whichever task lay ahead. This ancient superstition still rings true today as 30% of people “touch wood” for good luck, but it seems that crossing fingers or saying “fingers crossed” could actually be a safer bet! Over ¼ of people cross their fingers or say this for good luck and 20% of them actually experience it after doing so. The symbol of crossing your fingers dates back to the pre-Christian belief in the powerful symbol of the cross, as the intersection is thought to mark a concentration of good spirits and served to anchor a wish until it could come true. It seems like this is still working today! To put this into context, only 18% of those who believe in touching wood actually experienced good luck after doing so. When it comes to karma, 80% of women believe in it – which is 15% more than men. While those in the North East believe in good luck less than people in other parts of the UK, they do have a stronger belief in karma than all but one other region. Second only to the North West, 57% of people in the North East believe in karma. This is particularly interesting when considering that only 33% of people in this region consider themselves superstitious and 50% believe in good luck. Could the North East be the most pessimistic part of the UK? Do we lose our belief in good luck at middle age? It seems that the belief in good luck takes a dip for those approaching middle age. The survey revealed that the younger generation appears to be the most optimistic in this sense, with 56% of 18-24 year olds believing in good luck. As we age, this superstitious outlook decreases as only 49% of people between 45-54 believe in the concept of good luck. But it seems that this outlook comes back as we get older, as the age curve then appears to head upwards again as 54% of those 65 and older believe in good luck, the second-most of all age brackets. The luckiest region in the UK? The most superstitious regions in the UK are the East Midlands and the South East, with 37% of people in both considering themselves as such. Although London and the Midlands have been responsible for the most millionaire National Lottery winners since it launched in 1994, our findings show that you’re more likely to win if you’re from Wales. While only 17% of people from Wales are superstitious, when looking at the population and number of winners, it turns out that Wales is the luckiest part of the UK with 1 in 10,500 people having won the lottery since it began. The survey found that people in Wales also cross their fingers more for luck than those in other parts of the UK. Crossed fingers is famously the logo of the National Lottery too… Could this be a coincidence or have Wales just been the ones to pick up on the lucky symbol? Looking for luck in 2019? Be sure to kiss someone on New Year’s Eve! With the new year quickly approaching, how can you secure the best chance for it to be a lucky one? Almost ¼ of people, 22% to be precise, believe kissing someone at the stroke of midnight on New Year’s Eve is the best way to secure a lucky 2019. If this isn’t on the cards for you, just be sure to not loan out any money, as 10% of respondents believe that this is the next best thing when it comes to giving yourself the best chance of a lucky new year. Does believing in good luck actually make you luckier? Although this will always be difficult to prove, the results from our study seem to suggest that it does. Researchers argue that science may also have a role to play in good luck as believing in good luck will boost your confidence – and in turn – performance. With the statistics to show that the biggest believers in good luck are also the regions with the highest number of millionaire lottery winners and with 20% of people having experienced good luck after crossing their fingers, it might be safe to say it’s worth giving the belief in good luck a shot. What have you got to lose?